The Chicago Death March proper started at 8am on May 5th, at the 18th Ave station on the El’s Pink Line. 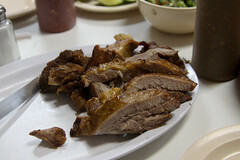 After a mere 30 minutes of walking (and one stop for pastries), we got to our first major food stop: Carnitas Don Pedro. The entire Pilsen neighborhood is filled with various Hispanic grocery stores and convenience stores, several of which had the pleasant smells of roasted pork coming out of them. 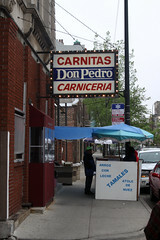 But as we approached Carnitas Don Pedro, I could start smelling an intense roasted pork smell almost a block away. As we arrived at the fairly plain storefront of Don Pedro, it was clear, we’d arrived at the epicenter. Walking in the door, the first two things I noticed about Don Pedro is that the interior is cramped, and it’s warm. Right inside the door, it’s a fairly narrow aisle between two serving counters, one to the left with tacos and stews, and one to the right that’s purely for ordering the meat products. The latter of these is the really interesting one, since at any given moment the meat counter has a giant tray of chicharrónes, the wall behind it has an impressive array of chorizo hanging up, and the carving station in the front window a giant pile of carnitas. And when I mean giant, I mean giant, with probably 60-80 pounds of meat on it (see below). But, like the many Texas BBQ joints I’ve visited, Don Pedro is mostly a carniceria: the sorts of items you can buy at the meat counter are basically meant for outside consumption (they won’t sell you any tacos but the brain tacos, for example, but will sell you plenty of taco ingredients: carnitas, tortillas, salsas, onions, cilantro…). But if you manage to slide your way past the meat counter (which was already hopping with activity at 8:30 in the morning), they’ve got about a half dozen tables and a few staff that will offer some table service. To be honest, I’m not sure there’s a menu, since the eat-in options are pretty limited: you can order full or half plates of meat (a full plate holding about two pounds of meat), some tacos, and any of the stews or soups. 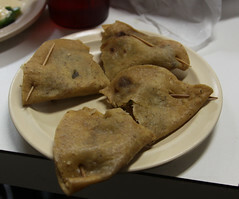 They’ll also bring out tortillas, toppings, and salsa with a meat order so you can make your own tacos. Being that we just had breakfast minutes before (down the street at Nuevo Leon, where we got pastries), we opted as a table to get a half plate of carnitas and some chicharrónes, and a half brain taco for each person. Well, that half a plate of carnitas was a seriously good spread, coming out as a mound of roasted pork piled on one end of the plate. Making use of the tortillas (they gave us something like 25 of them) and the excellent salsa, pico de gallo, and pickled peppers, there was more than enough food for us to all have several tacos. And this was some seriously good carnitas (indeed, a week later as I was dining down on some pulled pork in Austin, I still was thinking “this pork is good, but not as good as Don Pedro…”). Roasted and basted in it’s own lard drippings until fall-apart tender, this was great stuff: rich pork flavors, perfectly tender, little crispy bits of skin. This was pork that was so good that words start to fail me. The chicharrónes were also perfectly done. I’m used places handing out chicharrónes that are little grease bombs, but these were perfectly light, crunchy, and really nowhere near as greasy as you’d think. It was almost like eating pork-flavored popcorn, and made a rather pleasant side to the dish. The brain tacos? Not as much of a fan. These were actually quite good, with a nice texture, a good spicing level, and fried up nicely, but the various table salsas we had didn’t complement it well (they all seemed a bit watery, to be honest). I enjoyed the half of the brain taco I shared with Carol, but I don’t think I’d get it again. Probably the best thing about this? Our table of four had what I would call a “solid breakfast” for four people, or a “feast” for two people. The table had no shortage of pork, chicharrónes, tortillas, salsa (two types), pico de gallo, onions, cilantro, or pickled peppers. And Martin even had a coke. What was our bill? $9. Incredible. We’re obviously not the only people that like the place, either. Granted, it was a Mexican holiday (Cinco de Mayo) on the day of the march, but our waitress said that they only did “a little more business than usual” that day. Apparently, usual means “moving several pounds a minute of carnitas out the door”, since they burnt through two trays each of the carnitas and chicharrónes while we were there, and kept bringing out giant replacement trays from the kitchen out back (that kitchen must be a glorious sight!). They also seem to really like serving the customers here: little samples of meat are offered to prospective customers, they’ll let you pick and choose which bits of pork you want (although I’d probably find myself lacking the right Spanish vocabulary to leverage this), and they really went overboard with the hospitality when we decided to stay there to eat. My only regret? Knowing that the Death March was a day long marathon of eating and walking, we didn’t get more food. I’d really love to try some of their other meats (the tripe and chorizo both looked wonderful, for example). I’ll have to go back at some point.